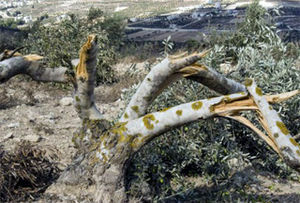 Israeli settlers have attacked Palestinian orchards in central West Bank, damaging a vast area of olive stands by uprooting hundreds of trees. The assault came Monday night in groves near the village of Mukhmas, a few kilometers northeast of Jerusalem (al-Quds), close to the illegal outpost of Migron, Haaretz reported. Locals said this was the third time the settlers had attacked their gardens in the relatively quiet area, seldom a scene of confrontations with Israelis. The extent of the destruction and the damage done to the trees across a wide swathe suggested the raid had been well-organized and carried out by a group of people.